Costa Rica|Manuel Antonio National Park|Snorkeling at paradisiacal beautiful beaches..
Playa Espadilla Sur is one of the paradisiacal beautiful swimming beaches inside the national park. 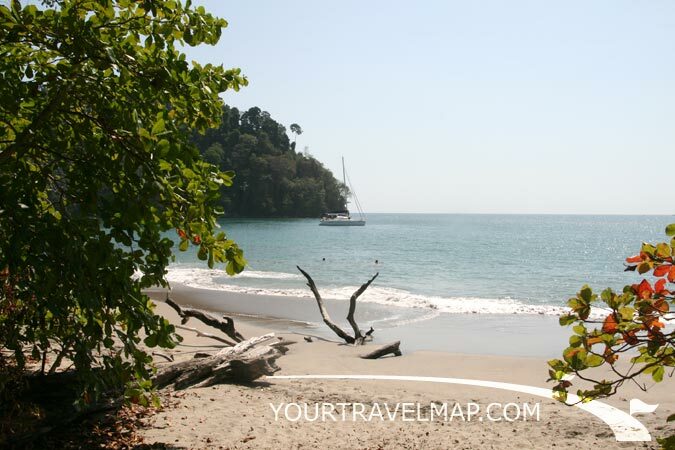 Manuel Antonio National Park in the province Puntarenas is the smallest national park in Costa Rica. 1983 hectares of land and 55120 hectares of ocean are protected. Yearly more than 360.000 people visit the park. The multitude of wild animals and the beautiful bathing beaches make this national park so popular. Playa Espadilla Sur and Playa Manuel Antonio, also known as Playa Blanca, are protected beaches with gentle waves for families and kids. The waves here are very small. Playa Espadilla Sur is one of the less crowded beaches in the area with good swimming. It is a swimming beach, but watch out for currents! Most visitors relax at Playa Manuela Antonio. Palm trees that bow down towards the water provide shade and protection from the sun. 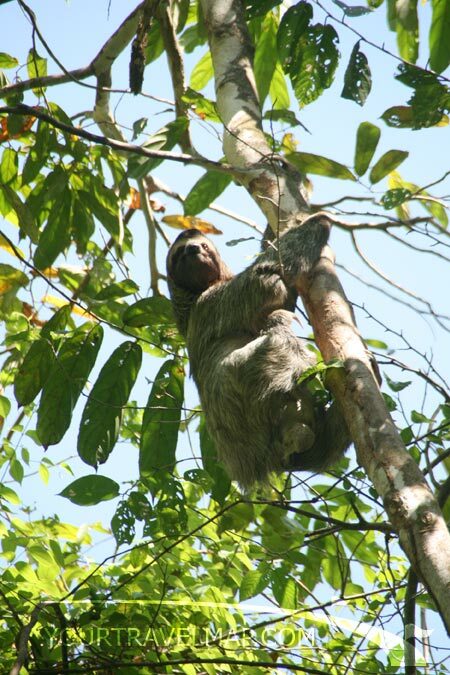 A sloth on the trail from the park entrance to the beach (Sendero Vehicular El Perezoso). Wildlife in Manuel Antonio are used to humans being close by, so are therefore far more approachable and easier to photograph. 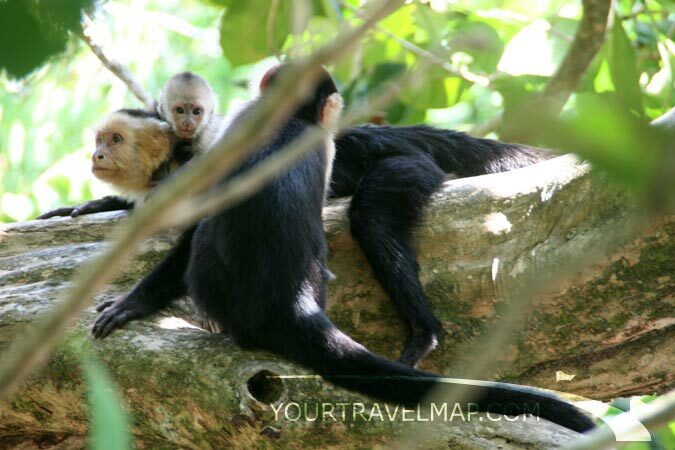 Mapaches, iguanas and white-faced capuchin monkeys are easy to spot close to the beach. 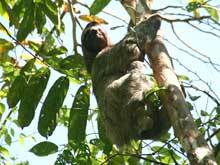 Sloths hide in the trees along the trail from the entrance of the national park to the beach. To observe more animals it's recommended to hike around Punta Catedral. Squirrel monkeys, howler monkieys, white-faced capuchin monkeys, raccoons, pelicans, toucans and laughing falcons. The narrow land bridge that connects Punta Catedral to the mainland separates Playa Espadilla Sur and Playa Manuel Antonio. Punta Catedral used to be an island but over the years sediments piled up connecting it to the mainland. 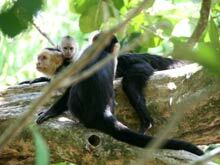 A family of white-faced capuchin monkeys. 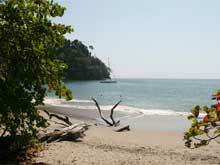 Manuel Antonio is wonderful for swimming in the calm protected water and for snorkeling. Especially in the dry season the visibility is good at the reef. Careful with the manzanillo trees and their poisonous fruits. Simply touching them can already lead to skin irritations. But don't worry there sufficient warning signs wherevers there is a manzanillo tree. The Manuel Antonio National Park is the smallest national park in Costa Rica. The Manuel Antonio National Park was established in 1972. The average annual temperature is 26.8°Celsius (80.2°Fahrenheit). Business hours: The park is open Tuesdays to Sundays from 7:00 am to 4:00 pm. On Mondays the park is closed. Manuel Antonio National Park telephone: (506) 2777 5155.